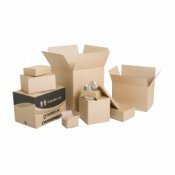 Looking for a non-standard sized corrugated cardboard box? Check out our vast range of miscellaneous sizes including Single Wall & Lidded boxes. Can't find the size you're looking for? Give the team a call today on 01942 524 256 or visit our Contact page. Next parcel collection is in 3 days 12 hrs 16 mins Buy before then to get free UK Mainland delivery, for the next working day.